Cockburn's (Coh-burns) was founded in 1815 and has grown to become one of the world's great port houses. 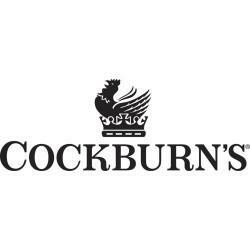 Makers of a complete line of fine ports, including Cockburn's Special Reserve - the world's most popular premium port -Cockburn's is known worldwide for its mature, less sweet wine style. What sets Cockburn's apart from all other port houses is a rigorous quality control standard exercised on all aspects of production. Being the largest vineyard owner in the Port district also gives Cockburn's significant access to stocks of aged wines for its many fine blends. Cockburn's family of ports includes Special Reserve, Vintage Port, Anno (Late Bottled Vintage) and Quinta dos Canais (Single Quinta Vintage), Fine Ruby, Fine Tawny, and 10- and 20-year-old Tawnies. James Suckling 98 “Superb: the greatest ever vintage Port from here.” Wine Spectator 97 "Amazingly fresh and juicy, with concentrated raspberry and dark cherry flavors that are well-sculpted and pure. Very minerally midpalate, this offers a fruity finish that features luscious chocolate notes.